Full servo horizontal pillow-pack wrapper, specifically designed for the dairy sector, to obtain pillow-pack style packs from a flat reel of heat/cold sealable wrapping material. Sturdy construction with a carbon steel fabricated frame, compact design, cutting edge hardware, reliable and operator friendly control software are the results achieved in this project, expression of experience achieved in many years of manufacturing of flowpack machines and automated lines. A high quality innovative machine. Cantilevered Construction: manufactured with modular pre-assembled units designed to be easily accessible and replaced. The front of the machine is free from any obstruction. Elegant and rational design, simple yet sturdy construction. Operation: full servo wrapper with axis motion controller and brushless servomotors. To drive: infeed conveyor, fin seal rollers, sealing crimpers. No mechanical drives: drive motors are connected directly to the various assemblies. The electrical panel is housed inside the machine frame and protected from the external environment. Compact design, easy cleaning: cantilevered structure made entirely of AISI 304 stainless steel with rounded corners and new design concept called “independent perimeter support” make cleaning and sanitising operations extremely simple and effective. Can be fitted with automatic feed belt washing system (optional) designed to be connected to a centralised CIP system. Ergonomic design: HMI and start/stop buttons have been ergonomically situated to facilitate accessibility. Reliability: internal expanding reel-holder shaft with fine adjustment of reel centring and equaliser brake. High speed and versatility: up-to 160 cycles/min. and capable of wrapping endless different products in the food and nonfood sectors. Human/machine Interface: colour touch screen. User friendly HMI to adjust all the machine parameters and save them in a dedicated recipe. The PFM Sirio will automatically adjust the bag length, print registration position, the crimpers position the dwell and the wrapping speed. The adjustment of the sealing temperature of the fin seal rollers and the transverse sealing crimpers is integrated into the touch screen. Ultra-hygienic tilted inlet conveyor belt with interchangeable pushers. Servo-assisted machine featuring 3 brushless motors controlled by means of H.M.I. high-resolution touch screen and simple software. 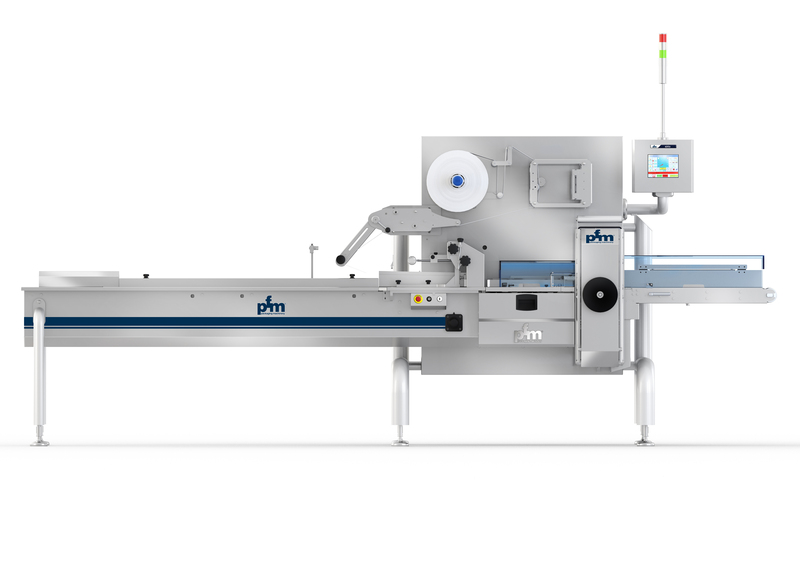 Packaging speed: the PFM Sirio performs 160 mechanical cycles a minute with perfect seals. AISI 304 cantilevered structure with independent perimeter support, compact, robust, easy to inspect and perfectly sanitisable. Drop-forged steel transverse sealing unit. Internal expanding reel-holder shaft featuring fine adjustment of reel centring and equaliser brake. UBIQUITY is the innovative PFM software platform for tele-service that allows the zeroing of distances by limiting travelling and operating on the control panel of the multi-head weighers on PLCs when installed on the wrapping line.